For the next few days, ANBAD is pressing clammy flesh against clammy flesh at The Great Escape, the UK’s premiere new music conference/festival/beano-by-the-sea. There are more bands than one could possibly hope to see, including ANBAD favourites Mmoths, D/R/U/G/S, Beth Jeans Houghton, and so many more that even Hype Machine had to create a special page to list all the recommended ones. 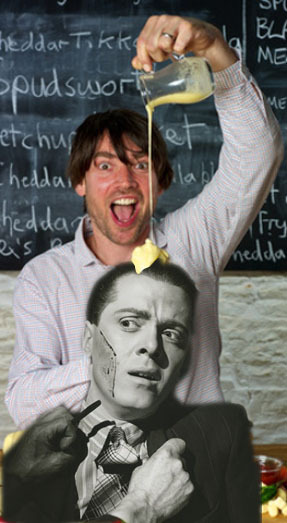 In tribute, Alex James, cheese connoisseur and official ANBAD pourer of Molten Yellow Love, gets to grips with Dickie Attenborough’s classic movie Brighton Rock. FIRST! Le Common Diamond are everything you want out of a French pop band: distant, sparse, arch, immediate and yet sharper than a box of tacks. Nice, slow, and with a bizarre groove all of its own. THIRD! Sophie Flynn conjures up the spirit of Helen Love in her spazmoid punk-pop song USI, and we’re all left wondering why it’s taken someone so long to do it. FOURTH! Are Little Night Terrors aware that this writer, as a child, used to be plagued by night terrors? Where he’d wake up screaming? Because the sekeltons were coming to get him? Do they know that? Do they care? Posted on May 9, 2012 by Joe Sparrow. This entry was posted in Headline, Today's New Band. Bookmark the permalink. I just spent a week in the company of the founder of Great Escape. He’s quite a character. The music industry’s equivalent to the Duke of Edinburgh (but with a stetson and a million Morrissey anecdotes). Perfect analogy. And I don’t even know the man.